“In this modern medical age, I fear that we are in danger of losing the fundamental and important knowledge of how to take care of our health and the health of our families. – Tieraona Low Dog, M.D. 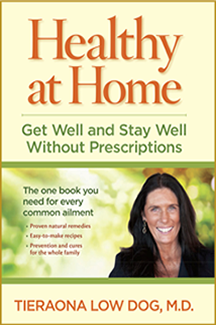 In Healthy at Home, Tieraona Low Dog, MD shows how integrated remedies such as herbs and simple home practices can treat many ailments — with the added benefit of no doctor bills. Sometimes a prescription drug is not the right medicine for getting well. Herbal and natural treatments are gaining traction as new research shows that the inappropriate use of drugs, such as antibiotics, are threatening our health. Never have we needed this advice more than now, as worries about not only antibiotic resistance but hospital-borne infections and pandemic threats make us yearn for the days of doctor home visits and mom’s chicken soup. Dr. Low Dog guides readers in identifying, responding to and caring for the most common ailments for the whole family. Combining her herbal wisdom with her talents as a family physician, massage therapist and midwife to teach, Dr. Low Dog uses easy-to-understand terms, how using natural remedies can reduce dependency on pharmaceuticals and over-the-counter medications, which in some cases may not be as safe or effective as we think. At the same time Dr. Low Dog, an integrative physician, recognizes that there are times when people must turn toward allopathic medicine in search of a solution to their health issue. She clearly points out warning signs that let you know when more than self-care is necessary. The book is organized by common ailments such as minor infections, respiratory ailments, digestive problems and nervous system complaints that generally do not require a visit to a health care practitioner for a diagnosis or treatment. Dr. Low Dog explains the basics of each ailment, showing how to identify, prevent and minimize the symptoms. She provides recipes on how to make dozens of gentle and effective natural remedies and explains where to purchase the herbs she recommends. Each section also includes a checklist to help you decide when it’s time to consult a health care professional or get immediate medical attention.